I normally don’t address current events or controversial issues on this blog. But news of the torture, captivity, and severe abuse and neglect of the Turpin’s homeschooled children is prompting me to speak out. I don’t have answers for how to prevent every case of child abuse, unfortunately. But I do have information that I think must inform our discussion about the issue and even prompt our action. No doubt you’ve heard some of the horrifying details about the Turpin family in California. This mother and father of 13 children ranging in age from 29 to 2 are accused of starving, abusing, and holding them captive in deplorable conditions. Honestly, the case has given me nightmares. I want to say in no uncertain terms that I am mortified that their registration as a homeschooling family may have been used to allow them to continue abusing their minor and adult children. I am praying for the children and also praying that we can prevent the abuse of more than 600,000 children in the U.S. I want to share my background with you before I launch into the topic. I am a clinical psychologist, not currently practicing. As a mandated reporter of abuse, I am familiar with the definition and signs of abuse. What I am also familiar with in this case is how to evaluate research and statistics. I have the added experience of having homeschooled my children for 19 years. An estimated 3% of school-age children are being homeschooled in the United States for a total of about two million students. These are not exact numbers because not all homeschoolers are required to register themselves as such. Is child abuse among homeschoolers a “widespread problem”? In the L.A. Times, Rachel Coleman and Kathryn Brightbill wrote that the Turpin case is indicative of a widespread problem of abuse in homeschooling families. They list several examples of not just abuse but torture by families who claimed to be homeschooling. Ms. Coleman and Brightbill, as staff members for the website ResponsibleHomeschooling.org, are privy to a database they have created of examples of severe child abuse occurring in families who again, claim to be homeschooling. They admit that they have no statistically signifcant data that suggests homeschooling families abuse children at higher rates than non-homeschooling families. However, I understand their perception that the problem is widespread. The details of these cases are disturbing and heart-rending. It’s their passion to protect these children that fuels their mission. Even one incidence of this type of severe abuse of a homeschooled child feels like too many. That being said, I still object to their use of the phrase “widespread problem.” It implies that it’s commonplace for homeschoolers to torture their children when there’s no evidence of that. To protect homeschooled children from potential abuse, Coleman and Brightbill argue that states should require academic assessments and medical exams. They insist that lack of contact with mandated reporters is what creates the possibility for families like the Turpins to torture and severely abuse. When considering their recommendation, these are the concerns I have. First, would this increased supervision of all homeschooling families prevent child abuse? I recently read a description of one of the Turpins’ daughters attending school in the third grade. The filth of her clothes, the body odor she had, and her use of a candy bar wrapper as a hair band suggest that she was being neglected at the very least while attending school. Details are emerging, but I have read nothing which suggests the Turpins were previously investigated for child abuse while at least one of their children was in school. The LA Times further reports that none of the children had seen a doctor in four years. Were any of the children seen by a physician four years ago and yet not reported as being victims of abuse? My point is that mandated testing and physicals may not have protected the Turpins and may not protect other children. Couldn’t these families also move as the Turpins did and avoid mandatory evaluations? I can imagine Coleman and Brightbill arguing that if more cases of child abuse were reported, their suggested legal requirements are worth it. But is that true? In 2012, 30 states reported that 8.5% of child abuse fatalities occurred in families who had received family services. Here is an example of one such child. These are child deaths and not data on continuing abuse. We can imagine continued abuse in reported families occurs frequently. There is no guarantee that had the Turpins been reported that their children would have been protected. That’s especially true given the current state of the foster care system. Caseworkers are typically overwhelmed by the number of children under their supervision. There is also alarming evidence of high rates of child abuse within foster care homes. The stress of being removed from one’s home can further traumatize a child. The Turpin children and others subject to severe abuse have to be removed for their own safety, regardless of the added challenge of adjusting to a new home and potentially being separated from some siblings. But it’s important to understand that removing children from an abusive home doesn’t always have a happy ending. I don’t think we have an answer to the question of whether increased supervision of all homeschooling families would prevent child abuse. My second question is whether the potential benefit of required supervision offsets the infringement of all homeschooling families’ rights. It’s possible that mandated testing and medical exams could create a new category of victims — children inappropriately forced to attend public school or removed from their homes and put into a foster care system that could truly victimize them. What if a homeschooled child has special needs and is actually doing well in a homeschool setting but doesn’t test at an average or above level on standardized tests? Will these children be required to enroll in public school? If so, will they be released to their homes if their scores decline? I think we know the answer to that. Will the same policy be applied to private school students who aren’t scoring as well as the government deems acceptable? If not, why not? There are many small, private schools where educational neglect could be hidden. There are a number of horror stories about parents apparently innocent of abuse having their children taken from them without cause. Do we want to put the parents of two million homeschooled children through an evaluative process every year to make them prove that they are not abusing their children? Will we also do the same to parents of all young children being reared at home? The highest rate of child abuse is among infants with over 1/4 of abused children being under age three. If this would be a requirement of homeschoolers only, what justification is there for that? The biggest risk factors for child abuse are alcohol and drug abuse and domestic violence. These risk factors are not correlated with homeschooling. And who would evaluate homeschooling parents? Might they be anti-homeschooling or of the opinion that a religious upbringing or conservative political views constitute abuse in and of themselves? Such opinions are not rare. In fact, a fundamental belief of all homeschoolers is that their children are theirs to raise and not the State’s. Wouldn’t mandated supervision suggest that we have to qualify as homeschoolers to raise the State’s children? I’m concerned about legally required oversight of homeschoolers and I don’t think my concerns are unfounded. The third issue I want to discuss with respect to child abuse and homeschooling is children’s safety at school. The assumption of Coleman and Brightbill appears to be that homeschooled children have a better chance of avoiding abuse if they can be exposed to mandated reporters of abuse, teachers being one class of them. I understand this view. Parents who torture their children want to isolate them. Teachers could recognize signs of abuse and neglect and could contact Child Protective Services. But does the risk of the school environment offset this potential benefit? More than one out of every five school children is bullied. In fact, the Turpin girl was reportedly bullied in third grade. We are all familiar with high-profile cases of bullied students committing suicide and even responding to their bullying by shooting their fellow students at school. There have been a reported 11 school shootings in the U.S. in the last three-and-a-half weeks, though that statistic has been disputed. Regardless of the dispute, one might even refer to school shootings as a widespread problem. Bullying and school shootings aren’t the only abuse school kids are subject to. A frightening 1 in 10 students has been the victim of sexual abuse at the hands of school personnel. Using the rationale of Coleman and Brightbill, we ought to require mental health evaluations of all students and staff to prevent this type of abuse. I haven’t heard any calls for this kind of monitoring, however. How I think we should respond to the Turpin case and child abuse. I don’t want any child to be abused or bullied. Like Coleman and Brightbill, I want to protect children. I believe they are precious to Jesus. The challenge is how to do that without victimizing even more people. Get to know at-risk families and extend kindness to them. Experts tell us that most child abuse is neglect and neglect is highly associated with low income. Many families don’t have the education they need to parent effectively. They also don’t know the resources available to them. A mom has no idea where to get affordable childcare so she leaves her 9-year-old in the park near her workplace. You can offer encouragement and help in talking with neighbors or you can serve at-risk families through a ministry. In my area, Nurses for Newborns provides education and baby supplies during home visits that have been shown to be very effective in preventing abuse. Support organizations like this in your area with your time and money. If you believe a child is in danger, make a report to Child Protective Services. You will not be held responsible if your report is determined to be unfounded. Professionals like psychologists are mandated reporters, but we should all consider ourselves mandated reporters when a child is at risk of serious harm. Here are signs to look for. Get to know your neighbors as a homeschooler. In the aftermath of the Turpin case, people who don’t know us well may be suspicious of homeschoolers who are very private. If you are a Christian as I am, you are to be serving your neighbors anyway. People need to see that our kids are healthy and well-adjusted. Talk about what you’re doing in your homeschool. Many still don’t understand that most homeschoolers have a great deal of social contact through various activities and classes. We want to advocate for homeschooling instead of living in fear of being reported for doing so. Joining HSLDA is a good step to protect yourself from unwarranted reports of neglect. You can relax and be open about your family’s educational choice. Get help. If you are having trouble disciplining your children without being harsh or your mental or physical health is keeping you from educating your children, reach out for help. Yes, you may have to make a different educational choice while you are getting help, but it’s worth the sacrifice for your kids’ sake. There are many options available to you and it doesn’t mean you can’t resume homeschooling in the future. Coleman and Brightbill report that some abusive parents remove their children from school to “homeschool” them. The result, according to victims’ reports, is intensified abuse. This is likely the case for the Turpins. Abusive parents realize they can avoid detection by claiming to homeschool. Coleman and Brightbill argue that parents who have been reported for child abuse should have to be evaluated when they choose to homeschool. These abusive parents often are not homeschooling but they claim to be, creating an association with homeschoolers that is a problem for genuine, caring homeschooling parents. 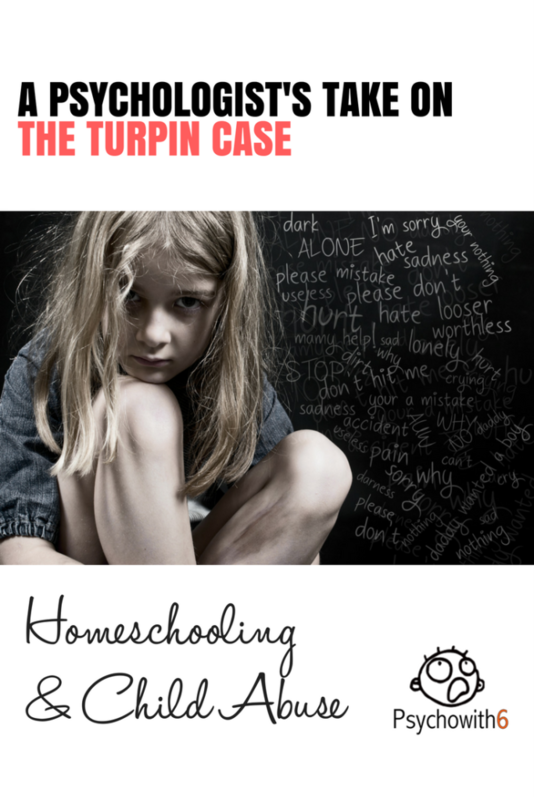 While I can see the potential for a teacher making an unfounded report of abuse that then makes homeschooling onerous for a good family, I believe the benefits for children and even the homeschool community may outweigh that risk. Very thoughtful, thorough analysis backed with facts and statistics. Additionally, the extra cost of added surveillance of homeschoolers by social workers could be very expensive. For state and local governments. The social workers would take time from investigating true cases of neglect, potentially causing more abuse to go undiscovered. That would be tragic. Carol, that is SUCH a good point about fewer resources being directed to high-risk families. Thanks so much for sharing it. Hello I am a homeschool mother of six and one on the way. I live in pa a state that requires mandatory evaluations beginning at year 8. Some comply to this with chagrin i however think this is good and wise. As I have been reading this case I cant help but think what if the teachers had reported this. I am thankful for the mandated reporter law and I am a sunday school teacher. I also am a mandated reporter. Sometimes it is hard to know when to say when. I do however wonder how this case would have turned out had the mandated reporter the teacher had reported this situation. I appreciate your perspective on this, Joanna. Thank you. I think the greater reality of the rise in homeschooling is the loss of trust in the general community to help parents raise their children. Schools now have far too many students for the number of teachers and support staff. But when people like the Turpins, who may have begun homeschooling after their child was relentlessly bullied for being dirty and poorly dressed, then completely retreat from the world, it breeds paranoia in both parents and children. I have seen no one address that, in today’s society, it is considered judgmental of parents to assume their children are not being cared for, if they happen to wear the same outfit daily that is often dirty. Many children wear uniforms to school, and no one assumes their parents are neglecting them. And what parent with several young children has never gotten behind on laundry? I am giving Louise the benefit of the doubt for the report of her oldest daughter in third grade public school. And I am also giving the teacher the benefit of the doubt, if the child showed no signs of malnourishment or abuse. However, it does enrage me that no one noticed the child being relentlessly bullied at school and stepped in to end it. Who knows how the Turpin family may have been positively affected by one teacher, or one counselor, taking the time to protect the daughter and reach out on compassion to Louise, who surely was overwhelmed at the time with maternal responsibilities. I know what you’re saying. Our culture’s tolerance of bullying of children is frustrating for me. I totally agree with everything you wrote. I only home schooled one of my 3 children, as her learning disability needs were not being taken care of at school. My other two were in the public schools. When my daughter was in elementary school, she told me about a classmate she was concerned about, he was thin, was not all that social, and she noticed he hardly had any food in his lunch. She told me she started giving him some of her food, so I encouraged her to do so, and started packing enough food for two in her lunches. I worked regularly every week, helping in each of my kids’ classrooms. I too, noticed this boy. I told his teacher about it, who said she had received concerns from other parents as well, and when the boy’s parents were questioned about it, they said they took good care of him and fed him. I did not see him after that school year was over. ——— In addition to this, I used to be a Preschool Teacher, one time at a private preschool, where I was confronted with implied accusations I had called CPS on a child in my class. I was shocked to be confronted about it, AND because I did not call CPS about any kids in any of my classes, ever, as I never felt the need. I was suspected because I asked that the mother be called to let her know that there was an infection on the child’s big toe, that I just wanted to make sure the mother was aware. That was the limit of my concern, that the mother may not have seen it. I have kids, I have missed things before. I quit my job there after that. —— The same school district that said there was nothing else to do for the very thin boy, started implying I was neglecting my oldest daughter, she was not doing well in school because of her learning disabilities. And they would not acknowledge that she had any learning disorders. I immediately put her under the care of a Psycho-Therapist, recommended by her Pediatrician, who advised me to home school her since she was having so many problems in school. I was not good at home schooling, but she refused to go to school after the age of 15, and was having a lot of difficulties socially and academically, that the school continuously blamed me for. When she was younger I had to pay a tutor over $300 a month to talk to her teachers to get the information we needed to get her homework successfully completed, as she was not being honest about her homework. Whenever I called a teacher to find out what I need to do, I was instructed to make sure my daughter has an adequate breakfast before school, and plenty of sleep, etc. She had a tutor for a couple years, until I no longer could afford it. We live in a “nice” suburb in the Detroit area, and our school district has an excellent reputation! I found out that I am not the only parent to go through all this in this school district! —— I am extremely concerned about the Turpin children, and it is so important for all 13 of them to stay together until they are ready to go out on their own. My husband is the 10th of 14 children. After his mother died when he was 8 years old, CPS evaluated them, and all the children hid the signs of neglect so they could stay together. They preferred staying together over neglect and starvation. My husband is an outstanding person, and the best husband and father anyone could ask for. All of his siblings are out-standing and good people who are outstanding parents, spouses, aunts and uncles. My children are from a previous marriage, and my husband has raised them as if they were his own. Also, my kids were always welcomed with open arms into my in laws lives. However, none of them ever want to see someone else go through what they did, it breaks my heart. You’ve definitely had experience on both sides of the issue. Thanks for sharing that. The way Alberta does homeschooling is that you have to be registered with a school board and facilitators meet with the family twice per year. These are check ins and are support for the families and as these facilitators are either teachers or educational assistants need to report any suspected neglect. No medical or psychiatric reports are demanded, just two check ins each year and a learning plan that is submitted. Thanks for that information, Amanda. I think the thing that people don’t continue to mention here with the Turpin case is how mentally deranged the parents are. There is no mental stability whatsoever with people, let alone parents, who can do what they’ve done. This is not exclusive to homeschooling. How many children are abused in their own homes behind closed doors at night by a step-parent or a mother’s boyfriend? It’s not done openly so who is going to choose which homes to go in and evaluate? Like you said, there is no more abuse happening in homeschooling families, potentially quite the opposite. I am sorry for the Turpin children and hope they can rise above these years of incredibly debilitating abuse. And, I’m also sorry for the countless children who grow up in non-homeschooling families that suffer abuse silently, also. Agreed. Mental illness is a major factor in this case.